In season two of this reality cooking series the format is rougher, tougher, and saw contestants venturing further off-road as they were expected to camp, cook and compete in some of the series’ most extreme challenges to date. It was a big disappointment they didn’t deserve, feels Thabiso Motloung (34) and Motebejane Mofokeng (36) from the Darkies Unleashed team who were the first to be eliminated last night on SABC3’s The Ultimate Braai Master: The Roads Less Travelled. Last night’s opening episode took place at the Hluhluwe Game Reserve picnic site where the 15 teams competed in a round-robin: three groups of five teams all went head-to head. 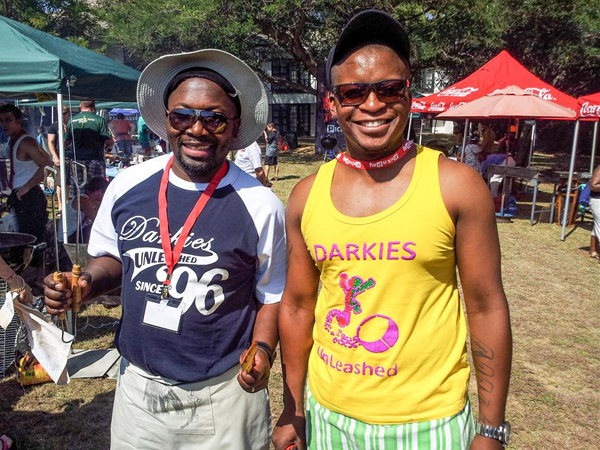 Thabiso and his braai buddy, Motebejane, who are friends from university, say they entered the competition because they “love good food and to experiment on the braai”. But the thing that scared them the most about the road trip was getting a puncture in the middle of nowhere and then having to unpack the car to get to the spare tyre! Thabiso thinks the wonderful thing about braaiing is “it brings friends and family closer when standing near the braai, sharing war stories”. What were your most memorable moments in the series? The auditions and the elimination round. We worked like a well-oiled machine, planning and executing. Splashing the Jesus-lookalike cameraman, Danny Kodesh, with water while we were doing the shoot for Renault. What was your biggest fear during the competition? Honestly, none – besides being the first team to go home! What was the most extreme challenge for the team? Motebejane’s mother-in law passed away the night we arrived at Hluhluwe Game Reserve. We had to deal with the emotions of either staying in the competition or going home so he could support his wife and family. In which way did The Ultimate Braai Master change your life? We met new people and appreciated cooking over open flames more. And we learnt how to chop onions and other veggies like chefs! Which team was your toughest competition? We didn’t think about anyone as the toughest competition – we were only focusing on us. And your favourite meat to braai? Chicken and seafood because there are lots of ways to prepare them.